T he Carrera is one of the most famous chronographs ever produced. Dating back to 1963, when Jack Heuer named it for the legendary “Carrera Panamericana” road race. The Carrera ties racing and watchmaking together in a way few other brands have been able to do. Jack Heuer’s father, Edouard Heuer, invented the oscillating pinion in 1887, and in 2010, TAG Heuer used the oscillating pinion to build the in-house manufactured, caliber 1887, which powers the Carrera today. 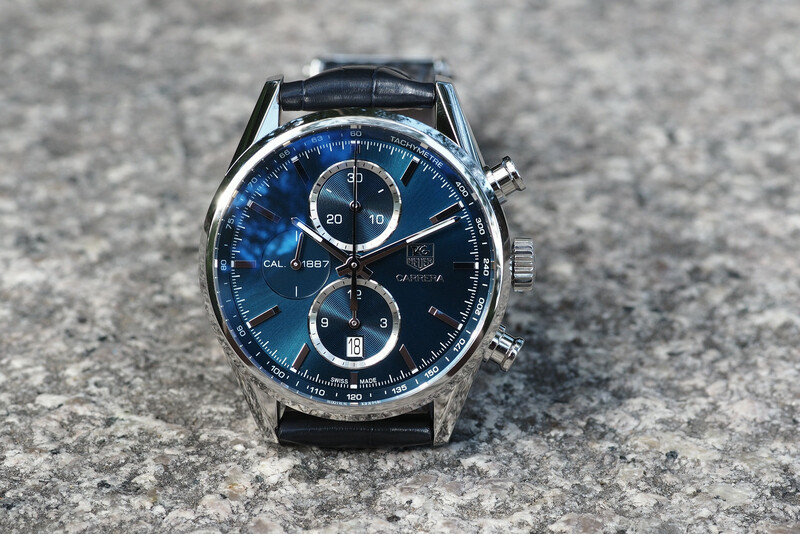 For this REVIEW, we selected a Carrera model with a beautiful sunburst finish blue metallic dial. In the center, at 12 o’clock, is a 30-minute chronograph counter. The 12-hour chronograph counter sits directly below at 6 o’clock. 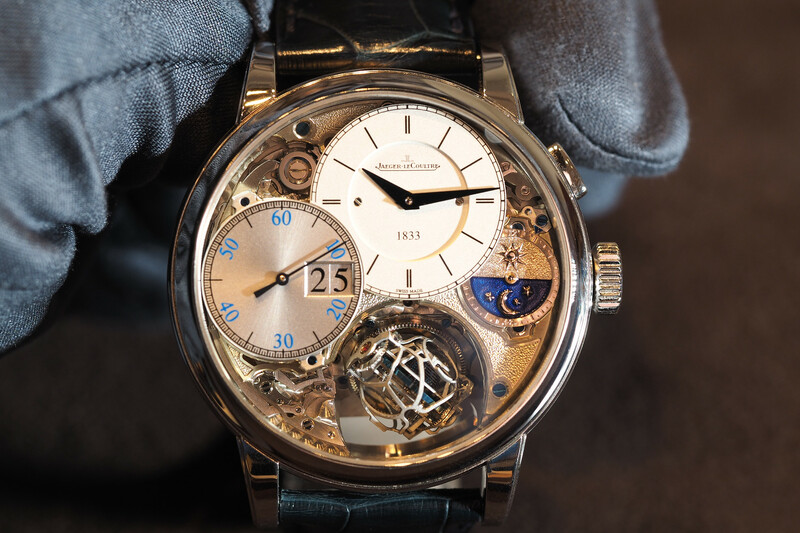 The two counters feature sloped silver rings, with circular guilloche in blue. On the outer edge is a sloped flange with printed tachymeter scale. The chapter ring has a printed minute scale and large applied hour indexes. At 9 o’clock is a blue small second subsidiary dial with no chapter ring, and in the same color as the dial, giving the appearance as though there are only two registers, even though it is really a three register chrono. 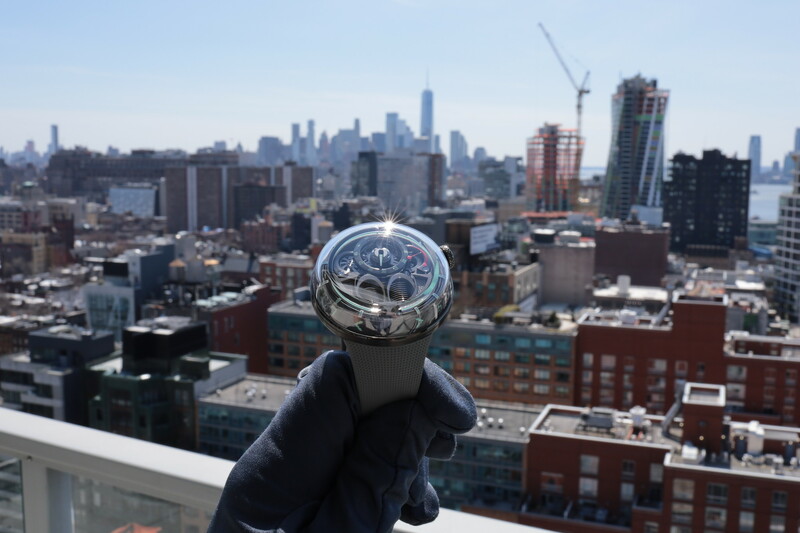 Baton style hour and minute hands feature luminous material. The top edge of the hour indexes also luminous material. Inside the hour counter at 6 o’clock is an aperture that indicates the date. An element that helps keep the dial clean, and easy to read. A 3-part case in 316L stainless steel houses the movement and features a fully polished finish. The bezel is fixed with short, straight lugs. Carreras come with a variety of pump pushers to start/stop/reset the chronograph, and while these are attractive, this style has a modern look, whereas I feel the vintage style is more attractive. A non-locking ridged crown, polished and embossed with the TAG Heuer shield completes the look. A gleaming polished case always seems to look great at first, although as evidenced by this sample model we tested, polished steel is a magnet for scratches. That said, scratching, patina and wear, if not excessive, can lend some character to a watch, especially a decade or two from now. Further, much of the scratches can be polished away fairly easily, if you prefer. A little on the tall side, the case is 15.75 mm thick. In a perfect world, it would be a bit thinner. In fact, it may slim down at some point, when TAG Heuer starts selling their newer chronograph movement the CH80, which is a thinner caliber. The diameter is about perfect at just under 41 mm (40.88 mm according to my digital caliper). The length from lug to lug is 49 mm. The lug width is 20 mm. On the front, a slightly domed sapphire crystal protects the dial. The back has a clear sapphire caseback that is screwed-in. The steel crown is non-locking and is 6.98 mm in diameter. It is wide enough to easily adjust, without protruding out too far and digging into your wrist. Water-resistance is 100 meters. The weight is 111.3 grams with the strap. Inside, is a self-winding movement, caliber 1887, with a column-wheel actuated chronograph. The main plate features perlage (circular graining) and some of the bridges also have a perlage finish. Most of the components have an industrial brushed or frosted finish, which is not “haute horology” level, however, it is befitting of the sporty nature of the watch and reasonable price point. Ceramic ball bearings ensure the skeletonized rotor winds efficiently and more quickly than standard ball bearings. The watch beats at 4Hz and has 39 jewels. The power reserve is 50-hours. Notably, the pushers actuate very smoothly, something you typically see on much more expensive chronographs. Matched with a blue alligator strap (20 mm at the lugs, tapered down to 18 mm at the buckle and stainless steel folding signed clasp. 100 meters water-resistant. The Carrera is an icon in the watch world, and it’s more closely tied to racing than almost any other chronograph. Even if the motor inside, caliber 1887, caused a bit of controversy when it came out, because the design was purchased from Seiko (the oldest Japanese watchmaker), it is ultimately manufactured at TAG Heuer’s, and to a very high level of quality. 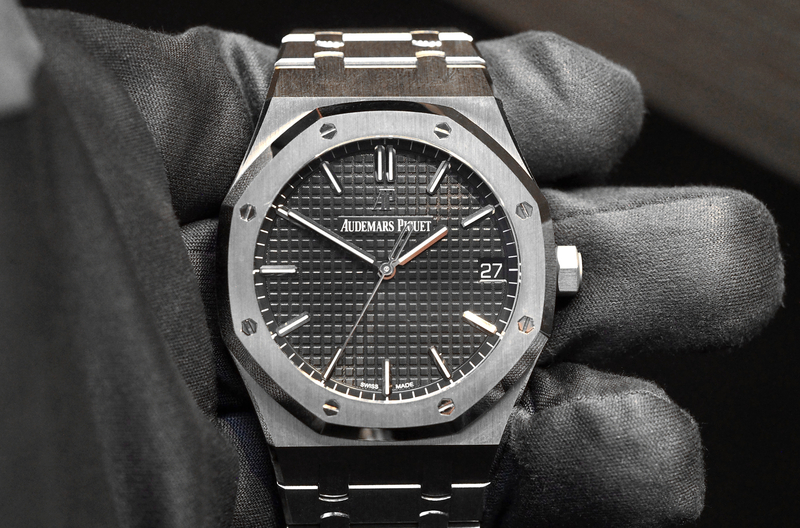 Moreover, the price of $5500 is almost impossible to beat for an in-house chronograph. Case in point, a B01 equipped Breitling timepiece retails for thousands more than an a caliber 1887 powered Carrera. Yet, in my opinion, the B01 movement is not as refined as the 1887. The actuation of the pushers on the Carrera are smoother. This version of the Carrera looks great and is a surprisingly good value in the Swiss luxury watch world, where value is a rarity.